I just saw the coolest Halloween treat that would be so much fun for a party, classroom, or just to eat for FUN. In Katrina's Kitchen shares this recipe for this Monster Mash Popcorn, complete with candy monster eyeballs. 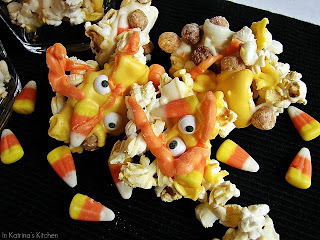 It looks to be full yummy deliciousness with the candy corn, cereal, popcorn and melted chocolate. I think I want to go make a batch right now.